Beth Hicks is a current student of our Become a Health Coach program and is on her way to becoming a top-notch Coach! She spends part of her time coaching, part of her time being an awesome grandma, and the other part as a student. To learn how she balances it all read the newest edition of this Day In The HCI Life Blog! Hi everyone! My name is Beth Hicks and I am currently a student with HCI. I’m beginning to build my coaching business, Total Wellness Coaching. I have been happily married to a wonderful, supportive man for 40 years. I still can’t believe it has been 40 years!! We have two children and three grandchildren. 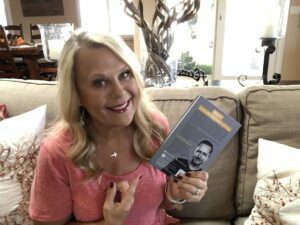 I was the first to retire from my home-based medical transcribing business and my husband followed, retiring from the Los Angeles County Fire Department. I have had a few jobs in my lifetime, but I found that the businesses I worked from home have been my most treasured and rewarding. 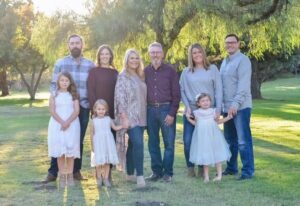 Upon retirement and after the birth of our grandchildren, we were blessed enough to be able to dedicate two days a week just to them until they went off to school. Because my granddaughters spent so much time at our house, I became very passionate about making my home chemical free. This passion, combined with a lot of self-development, led me out of retirement and into a network marketing business featuring hair-care products that are free of harmful chemicals. I continue to be involved and active in that business today! I began my road to self-discovery while working on my network marketing business. I read book after book that focused on self-development and I realized there was much about me that I kept hidden from others and even from myself. Whew, heavy! After working on the inside, I began to work on the outside. I have a very long and complicated history with weight. My mind was finally in the right place to get to work. Over the course of one year and two weeks, I successfully shed 88 pounds. This weight loss journey was so different than past experiences. I actually enjoyed the process; imagine that! I knew that I wanted to inspire and motivate others—it became my mission. When I began my journey, I decided to take all my Facebook friends with me. Blogging my experience led to an overwhelmingly positive response. 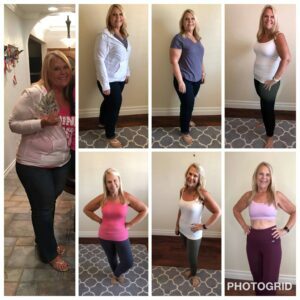 I joined weight loss support groups and shared my blogs there as well. One day, I grabbed my phone and a tripod and did a Facebook Live, featuring me cooking. Talk about stepping outside my comfort zone! I showed up every week from that point on with a new recipe! Within this platform, people began reaching out to me wanting help and tips for success. I knew that helping others see the possibilities for themselves was in my future in some way. I decided the best way I could reach the masses was to open a private Facebook group of my own. I currently have 3,800 members, all women. I am a coach to 3,800 women (and growing) who struggle with weight issues. This fuels my fire! This is my purpose. This sequence of events has led me to where I am today. 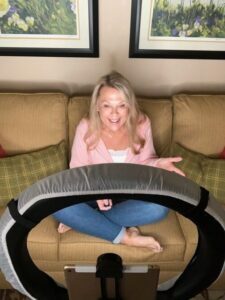 I felt an incredible pull towards health and life coaching midway through my weight loss, but was afraid. I learned the importance of pushing through the fear to the other side. After much research, I decided HCI was the place for me and enrolled. I am invested and an enthusiastic student! 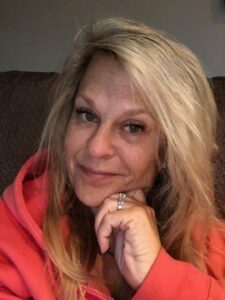 I always get up an hour before my husband and begin that time with a short devotional, then begin working on my business, answering e-mail, responding to messages, and working on my Facebook group content for the day. I take time to read through what is posted in my group and choose my subject matter based on their needs. When my husband gets up, he makes the coffee and we have some breakfast. 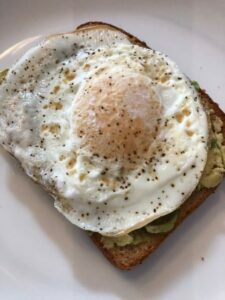 My go-to breakfast is an over-easy egg, whole grain bread, and a quarter of an avocado, sprinkled with a bit of pepper and I am good to go, with my cup of coffee! After breakfast, we take off for our walk. Depending on what’s on the agenda for the day, we will choose different destinations. It’s important to change up the view and keep it fresh! I walk 4-5 miles most days of the week. Our parks have wonderful workout equipment that adds to my routine. It’s a little over an hour where there are no distractions. I get a lot of thinking done while I pound the pavement. Exercise is very important and necessary for me. I also enjoy hiking and love nature and how it makes me feel. In the summertime, you will find me in a pool doing water aerobics outside in the sunshine with a couple of friends who enjoy the same! After I get my fitness on, I tidy up around the house. I am obsessed with keeping my environment organized. It’s my thing; I can’t help it! It’s a priority of mine to stay on track with my health coach classes. I devote about an hour a day for that; however, life happens and I am lucky enough to be flexible with my schedule. This platform for learning fits my schedule perfectly! Most days lunch is quick and simple. I grab a few nuts, an apple and/or a protein drink. I make myself sit down at the table and take my time. There is no phone, no iPad, no book and no TV; just mindful eating. On the days when my schedule is clear, I actually get dressed in something other than workout clothes, fix my hair, put a little makeup on, and pre-recorded messages for my Facebook group. I have a list a mile long of topics that I plan to touch on. I love to plan Facebook Live events for them as well. I believe that a spoken message impacts people in a different way than written messages. Most days, I start winding down right before dinner. I am not above being in my PJs at 6:00 pm! Dinner is my favorite meal of the day and favorite time of the day. I am not a gourmet chef by any means—my meals literally take less than a half hour to prepare. I am not a meal planner or meal prepper. 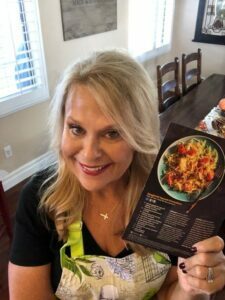 We love to grill and the crock pot is my best friend—he least amount of time in the kitchen, the better! After dinner, I make a few calls and usually I wrap it up by 8:00 pm with a nice hot shower, my skin care regimen, and a date with the TV. Reality TV is a guilty pleasure when it comes to my entertainment. Seldom do I make it to 11:00 news. I am usually tucked in around 10 with every electronic turned off. 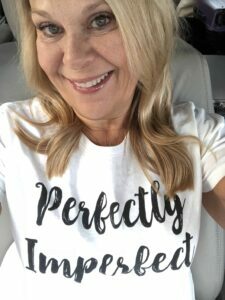 I am a work in progress and have to remind myself often that it’s progress and not perfection. That is huge for me! I continue to practice the balancing act of work (paid and not paid) with fun and adventure. I never stop setting goals for myself. I am all about self-care and making time for myself, but sometimes I forget. It has to be in the forethought of my mind, a constant reminder just how necessary it is. I look forward to my future in coaching. I love what I am learning and practice every day. The more I practice, the more these skills will become second nature. Schedule your time – If there are things on your calendar that do not bring joy or move you closer to your goals, remove them or delegate them. Ask for help – If you find yourself pulled in many directions at once, enlist the help of others. Progress not perfection – Everything does not always need to be perfect. Calendar – Paper vs phone? I love both and use both! Home based business 101 – Schedule your work hours and leave the everyday tasks alone until your workday is done! If you don’t, you may end up with a 12-hour day. Flexibility over rigidity – Go with the flow. Loud and Proud – Share with your friends and family that you have office hours and that you will get back to them when the day is done. Help – If you are financially able, enlist the help of someone to come in and give you a hand with cleaning, laundry, and yard work. I also want to add that when I finally stopped trying to be perfect and began to relax, I became such a better student and coach to others. I don’t need to be a perfect coach; I need to be an active listener who is curious. I need to provoke thought and gently guide my clients to change.